Former Sri Lankan armed forces chief Sarath Fonseka has rejected claims that the army committed war crimes in the final phase of the country's civil war. The general said that there was no intentional killing of civilians. His comments were made to reporters in parliament, where he was elected as an MP last month. As an MP he has special dispensation to be released from detention - where he has been held since falling out with the government - to attend parliament. The BBC's Charles Haviland in Colombo says that the general did not make a blanket denial and took care to stipulate that no war crimes took place to his knowledge. Our correspondent says that the issue is extremely sensitive for the government which this week dismissed allegations made by the International Crisis Group (ICG) that the military had shelled civilian targets. The ICG accused the government of being happy to blur the distinction between combatants and non-combatants. It also criticised the Tamil Tigers for forcing civilians to stay within the war zone. In December Gen Fonseka alleged that Defence Secretary Gotabhaya Rajapaksa ordered the killing of Tamil Tiger rebel leaders as they were trying to surrender last May. 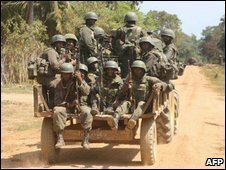 The Sri Lankan government said they were shot by other rebel fighters.